Beijing became the Capital of China for the first time during the years of the Liao Dynasty (907 AD - 1125 AD), of which remnants can still be found in the city today. The Liao Dynasty, who are also known as the Khitan Empire arose in North China, Mongolia and Manchuria immediately after the Fall of the Tang Dynasty Empire in 907 AD. During the Tang Dynasty Era (618 AD - 907 AD), Beijing was named Youzhou. Before counterbalanced by the might of Tang Forces, after their Fall the Khitan People managed to conquer considerable parts of China before being absorbed by the Jurchen Jin Dynasty of later years. The Liao Dynasty was established in 907 AD, and some decennia later in 938 AD, they established a secondary capital in what is now Beijing. Under the Liao Dynasty it was named Nanjing (the "Southern Capital") opposing the Northern Capital Shangjing in Inner-Mongolia. It was also known as Yanjing. At the end of the important but short-lived Yuan Dynasty the City now known as Beijing briefly lost its Capital Status to Southern Nanjing during the first 2 reigns of the Ming Dynasty. However, during the 3rd Reign (1403 AD - 1425 AD) of the Ming Dynasty (1368 - 1644 AD), in 1406 AD, the Capital City was moved back from southern Nanjing to BeiPing, renaming it Beijing. The original lay-out of today's Beijing, with a Central Axis running North-South through the City and the Forbidden City's Main Ceremonial Throne Hall (TaiheDian) in the exact center of everything was created at the beginning of the 15th century, on orders of 3rd Ming Emperor Zhu Di, a legendary Emperor today popularly identified as the Yongle Emperor. Having in effect usurped the Ming Throne after a devastating civil war which laid waste to large parts of the Nation including much of its infrastructure, the Yongle Era represents a fresh start of a new Nation emboldened with unusually visionary idea's and according massive National projects and expeditions, however also a Nation wounded by inner strife, confused and weighed down by an enduring political conflict. The northern Capital, through the virtues of his extra-ordinary Reign and its aftermath, is historically the city and legacy of the Yongle Emperor. The building of the current day historic or Old City center of Beijing started in the year 1406 AD with renovations to the district holding the former Palace of the newly arisen Yongle Emperor as the holder of the Title over the Fiefdom of Yan. This Palace was no longer to be of much importance, however it was nevertheless renovated and enlarged to serve as a Base for the Emperor whenever he may find it necessary to visit and make a tour of inspections of the ongoing projects under construction. This Palace used to be situated in section of the city then identified as Xinei ("inner west") but today the Palace no longer exists and the former Inner West Districts mostly lost in public memory. Planning the re-founding of his Capital in the north, among things in an attempt the escape and disrupt the powerbase of his many yet influential political enemies, the natural choice for the new but still legally disputed Emperor was to make use of his own powerbase. This powerbase of was Beiping, the administrative Capital of the large border fiefdom identified as Yan or the Kingdom of Yan (historically). Basing himself on his former Capital as the King of the northern Fiefdom of Yan - which previously had also been the Capital of the hated Mongolian Yuan Dynasty, in subsequent steps the Yongle Emperor then saw to the reconstruction of the former Capital of his Fiefdom "Yan" into his great political Capital, a city to be unlike anyone city ever seen before. Apart from the later Imperial Palace, the "Forbidden City", the construction of which began in the year 1416 AD, significant structures thus erected in the city of Beijing during the Yongle Era include its Bell Tower and its Drum Tower for Time-keeping and the two heavenly altars of Tiantan, the Temple of Heaven Park and the Temple and Altar of Agriculture, for prayers to the Heaven's and ensuring auspicious weather and abundant harvests. In addition, for protection, city walls were erected and beyond these city walls further projects were undertaken, both to strengthen and supply the city. 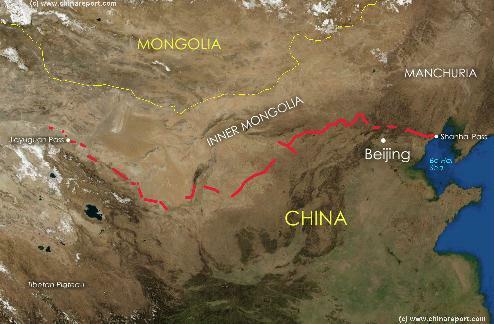 The generals of the Yongle Emperor oversaw large reconstructions and improvements on the Great Wall throughout China and engineers and armies of peasants expanded the Grand Canal further to reach Beijing. As a last step in the building of his new Imperial Capital, the Yongle Emperor ordered the construction of the large Shisan Ling Ming Tombs in the Province, North of Beijing, in so doing adding the final element needed for a proper Capital City. 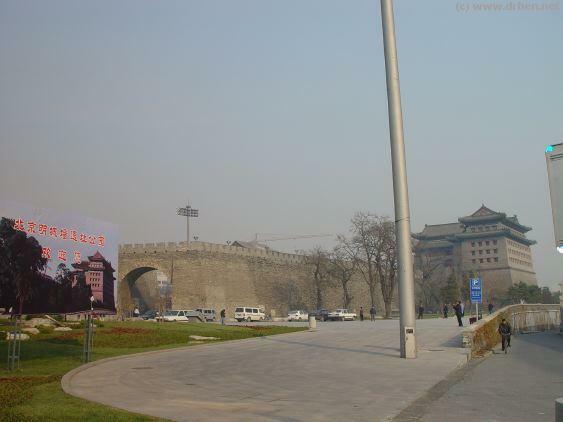 Architectural Lay-out of Beijing's Imperial Palace as it stands today -click to go to Map- . 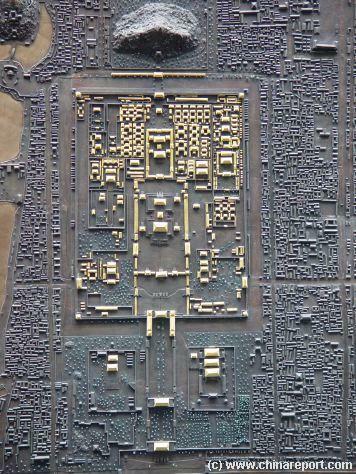 Throughout the Ming Dynasty and the majority of the Ching Dynasty, Beijing was a much greener City than it is today. In fact, although it could not compete with such water rich cities as Shanghai and Suzhou in South China, Beijing was built in an area through which several rivers flowed. Within the City itself ran a green belt formed by the many lakes of Jishuitan, and many more small rivers flowed through the City. 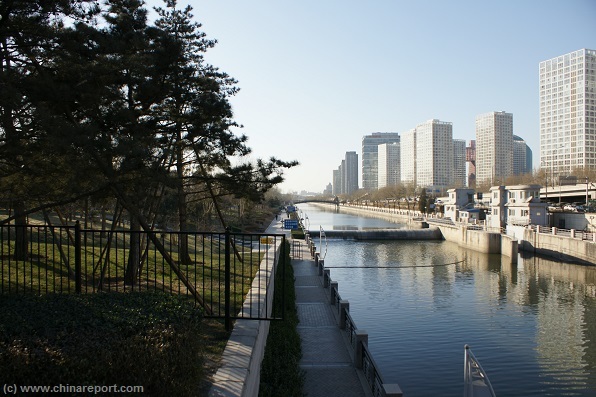 Outside of and encircling the City was the wide and deep city Moat which in turn provided connection to the historic Grand Canal - the longest man-made river in Human History- through the South-East corner and a connection to Tongzhou Village. 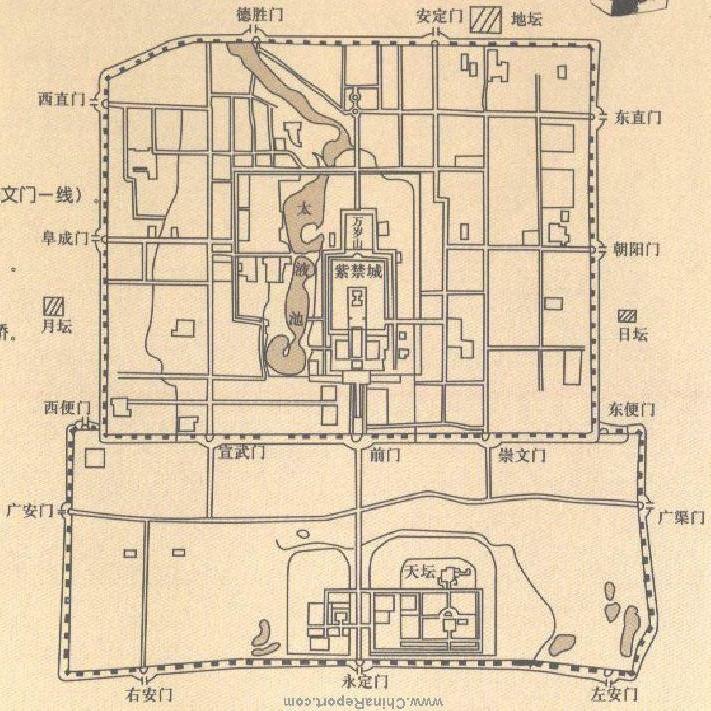 Schematic Map of the Lay-out of Beijing as the Imperial Capital during the Ming Dynasty and Qing Dynasty Era's. Not all Rivers are depicted on the Map. Mouse over Image to reveal Moat and Connection to the Grand Canal of the Ming Dynasty at Tongzhou. Each Shalan had its own products and community. Leaving the Community was forbidden and unheard of. Ming Era were fused into city districts, with a less strict economical arrangements for their inhabitants. The Green waterways of Old Beijing, as still preserved today in the Qianhai Lake near the Bell & Drum-Towers. A view of GuoZiJian Road, its Wooden Pailou and surrounding shops. The GuoZiJian Pailou is one of few such Arch Gates to remain in the City. Via the Grand Canal grains and others supplies reached the now huge Imperial City. Ships traveled up & down, with large vessels being able to sail on the City Moat. took place over water rather than over land and through the many small Hutongs within the City. During the early Ming Dynasty Beijing was strictly separated into various Hutong Area's, the Fang, with inside of them fence enclosed communities known as Shalan, each of which functioned as the home, ghetto and economical unit of that area. Shalanzan were designated by Name and their borders visibly marked by Beijing's now almost disappeared Wooden Pailou Gates. Each Pailou designated another Shalanzan. Each Shalan was the closed home of Generations of People, all of whom plied the same skills and trade as their ancestors. Beijing's Ming Dynasty Era Observatory which was run for the Imperial Court by Jesuits Priests during the later Ming Dynasty and beyond. As the lay-out of even the current city was largely created in the Yongle Reign of the Ming Dynasty, there are too many noteworthy landmarks of this Era dotting the City and wider Region to mention here. However, it must be noted that the most Famous Chinese Landmark of all, The Great Wall of China was created in its remaining form during the Ming Dynasty. Much of the extensive works on this staggering feat of Public Engineering were intended to protect the Capital City of Beijing and several defensive layers were constructed to encircle the City. Thus, among many historic monuments of Beijing, the nearby Great Wall of China ranks as the number one legacy left to the City by this Great Dynasty and its Emperors. 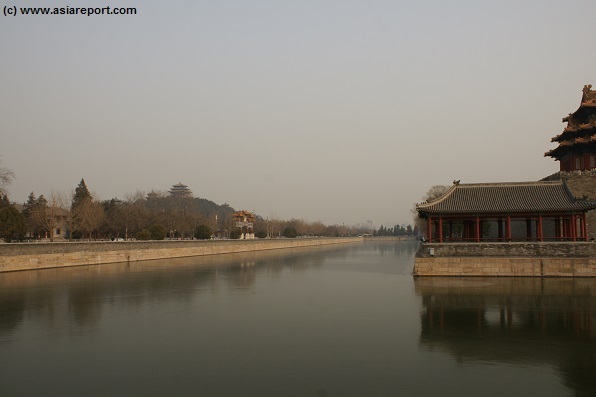 Ranked second on the list of Monumental architecture left by the Ming is not their magnificent Imperial Palace, but the now nearly forgotten Grand Canal, the sleuce gates of which were located at Tongzhou Village, now a district of the Megametropolis of Beijing. After these two most Monumental Achievements follow the many other Grand Historic Monuments created as part of the architecture of the Ming Dynasty Era Imperial Capital. These are the Imperial Palace, now the Palace Museum, the Temple of Heaven and 7 other Holy Altars in & around the City, the 13 Ming Tombs (Shisan Ling) sometimes mentioned as the "Chinese Valley of the Kings", Jingshan - Coal Hill, the highest point in the City until at least 1970 AD, the former City Walls of Beijing, the Ancient Observatory of Beijing and a multitude of Temples. A Last Monument that must not be forgotten is the Ancient Bell Tower of the City. Although originally constructed as a wooden tower in slightly earlier Era, it was rebuilt in stone and outfitted with a large Bell, which told the Time and dictated the rhythm of Life in the City for all throughout the Ming Dynasty years and long beyond. 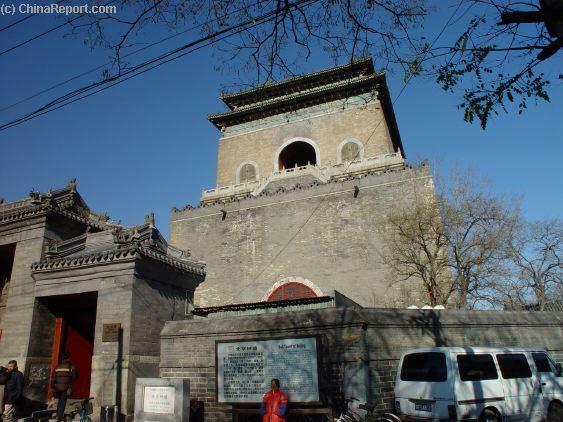 The Ancient Stone Bell Tower of Beijing, for centuries the Highest Building in the City (Tianning Pagoda and its twin were higher but stood outside the City Walls). 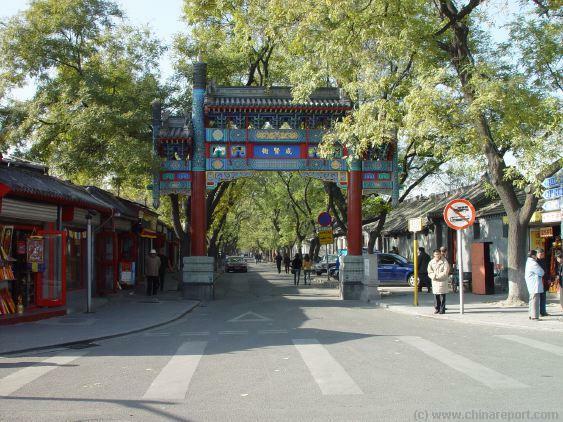 The Most Famous Shalan of all Time is the Da Shalan, a street which may be regarded as a mere Hutong but which however rose to Great Fame during the Qing Dynasty Era (1644 AD - 1911 AD). Dashalan was a shopping street and home to the better Guilds of Jewelry, Stone Cutting and similar handicrafts. As a result, the big shopping street had large Iron Gates which were open during daytime business hours, but which closed after the Old Bell Tower struck the evening watch. After that hour, a night curfew was imposed, its big impressive gates were locked and bolted until another day arrived. 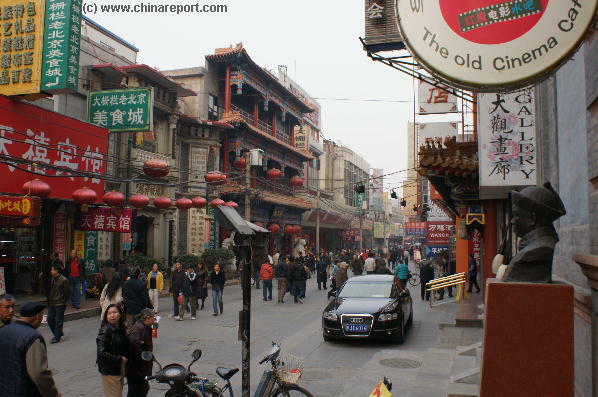 A view of Dashilan East Street in November 2007 AD just before major restaurantions and reorganization of the entire Qianmen-Dashilan Area. 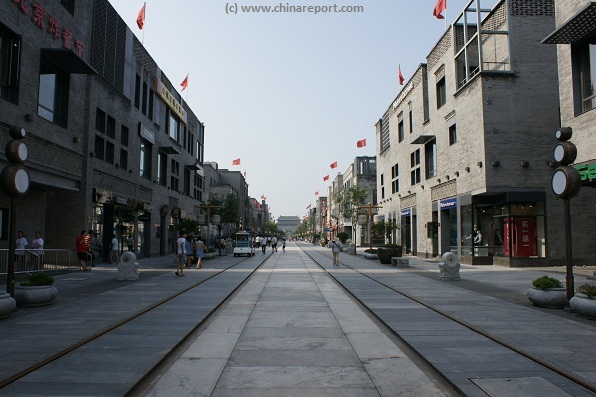 on a strategic location outside the QianMen, main city gate and just off the Central Axis of the City, the Qing Era saw Dashilar Street rise to be the number one commercial Street in Beijing. The success of Wanfujing Street came much later. south end of what today is the Chaoyang Central Business District of Beijing, all the way up to the city walls and into the moat surrounding the city. Entering the moat through locks situated almost underneath the Dongbian Men (South-East Corner Watchtower also "Red Gate"), one of the preserved watchtowers of the city which can still be visited today - boats could circle the city much as the blue line 2 line of Beijing Subway does today. From the exterior of the city, smaller vessels docked outside of gates or distributed what was necessary by means of a varied canal system, much of which today no longer exists. Rubbing of Matteo Ricci's Tomb Stone. Dated the year 1610 AD of the Ming Dynasty. 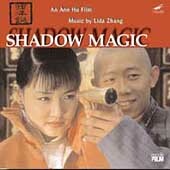 Originally on the christian semetary, later stored in Tenggong Zhalan, in the Xicheng District of Beijing. own creation in court circles, in the year 1608 A.D. the Jesuit Missionary Father Matteo Ricci reached an absolute highpoint in his attempts to communicate with the Emperor directly, when he was commissioned by the Emperor to make 10 maps, which were to be printed on silk and divided into 6 sections. Later Ricci concluded his commissioned work by creating 2 additional maps; one depicting the souther hemisphere and one showing the opposite half. Each of these Hemisphere Maps was then fitted to a side of the Dragon Throne inside the Hall of Supreme Harmony in the Imperial Palace (Forbidden City), a truly high honor for any creation of a foreigner in those times. Upon his death on the 11th of may of 1610 in Beijing, Matteo Ricci, received high honors from the Chinese Imperial Court which reserved him the right to a well chosen piece of land were his body could be buried. This was right usually only afforded to highly respected Chinese and the Ambassadors of Foreign Tributary Nations and so the court recognized Matteo Ricci with due honors for invaluable services provided. Leaving an astounding legacy to be followed by his followers, Matteo Ricci lives on in history as the groundbreaker of early East-West relations. is one of the most interesting off the beaten path locations to visit within the city of today. Although Matteo Ricci had founded the three earliest Christian Churches, in Zhaoqing (肇庆) and Shaoguan (韶关) in Guangdong Province, Nanchang in Jiangxi Province and Nanjing in Jiangsu Province, he had not been allowed the right to introduce the new architectural unit of a Christian Church into Imperial Capital. The Ming Dynasty city of Beijing remained thoroughly Chinese in all regards until much later, when around the year 1657 A.D. Father Adam Schall von Bell was awarded the right to found a Church and built it at Xuanwumen, just within the city walls. This Church stands today as the Southern Church (Nan Tang). In their task of sowing the seeds of the Christian Faith in this remote far eastern region of the globe the Jesuits pioneers faced many obstacles. As foreigners they were eyed with suspicion to begin with, and the preaching of a new and unusual belief in these most foreign of cultures led to further suspicions, misunderstandings and often outright hostility. You Tube Video: Brief Introduction to the Life and Works of Matteo Ricci considered the founder o/t Christian Church in China. City and refused his offer to hand gifts to the Emperor, was allowed no audience nor was permitted to stay on in the Capital. Father Matteo Ricci however was extraordinarily tenacious and determined. As a result, in january of 1601 he returned to the City Walls of Beijing having armed himself with the proper invitations provided by a friendly Provincial Governor. Finding himself accepted, he was then allowed entry and even permitted residence within the City Walls. In the process of his following years of residence in the Imperial Capital father Matteo Ricci became the founder of the first Christian Church in Beijing. Although Father Matteo had managed to gain his rights to stay within the city of Beijing, they were only one of many groups of diplomats, messengers and religious emmisaries begging for the court and the Emperors attention. Faced with the abundance of competition, as well as the heavy control of court protocol, the jezuit group found the making of direct connections with the Emperor difficult. The gifts, which they had brought in order to gain audience with the Emperor, were once again refused. Nor could they achieve any other form of direct communication with the Wan Li Emperor (Shenzong Reign: 1573 A.D. - 1620 A.D.). A resolution only occured after Matteo Ricci had petitioned the Emperor through a letter in which he advertized himself as an astronomer, geographer, geometrist capable of arithmatik. Along with the message came the gifts of a clavecimbel, a world globe and two mechanical clocks. Although at first the Chinese did not give a hint of this, the gifts raised considerable interest at court, and the necessity of explaining of their precise working mechanism would provide further opportunities for closer communication with the higher layers of the Imperial Court. A week later, when the clocks seized their operation Matteo Ricci found himself invited to visit the Forbidden City of the Imperial Palace becoming the first ever European to enter within. In February of 1602 he and a companion were even allowed to bring tribute to the Emperor, however when they reached the Dragon Throne in the Hall of Supreme Harmony, they found that they could only Kowtow to an empty seat. Clearly, more work needed to be done before any of them would have the full ear of the Emperor. Of the once Grand Canal with sailing ships and pullies passing by, within the Chaoyang District only a concrete channel remains . Recently complemented by a parklike green zone passing along its south side, it is an interesting and also scenic and off-the-beaten-path place to go for a stroll in Beijing. View of the massive South-East Corner watchtower and some of the space previously occupied by the wide moat that surrounded the city and connected to the Grand Canal. Recognized as a National historic heritage the tower was constructed between 1436 AD - and 1440 AD, making it among things the oldest such tower in Beijing today. the scenery that existed within the city walls would have been one alike that depicted in the famous Chinese scroll painting known as "Qing Ming Festival at Biangliang River". Although China of the time of the Yongle Emperor and his immediate successors counted a multide of sea harbors, and China - on orders of the Yongle Emperor - had made (globally) unprecedented overseas journey's and as it said; global maritime discoveries, the northern Capital of the Ming had no such harbor, and thus as one may understand, much of the wealth of the blossoming Chinese Nation eventually gravitated towards the Elite in the Capital via the route of the Grand Canal. of the dying Yuan Dynasty resurrected various Mongolian Tribes on the wide steppes between Kazakhstan and Siberia, or lingered in Tibet, no viable trade routes into Central Asia existed. As a result, or so it is theorized by historians today, the early Ming Emperors sought to find new exterior contacts in overseas island nations, hoping to spread Chinese Culture and the name of the Emperor, as well as seeking various trade and transport opportunities. Returning to the subject of the city of Beijing, during the Yongle Reign of the Ming Dynasty, the Emperors great aspirations of recapturing some of the glories of the ancient Han and Tang ancestors who truly had made their Capitals into international metropolises, were indeed fulfilled. Celebrating his success with the Grand Official Opening of his Capital and his great Imperial Palace (the largest such Palace in the world for at least the next few 100 years) in the presence of Kings, Princes and other Ambassadors representing no less than 22 Nations, the Yongle Emperor and with him the Imperial Capital celebrated what amounted to their version of the Beijing 2008 Olympic Games. It was the greatest and grandest festivity ever to be held in the previously war-torn, turbulent and poverty stricken but now re-unified Nation. Henceforth living in the greatest Capital of the world as they knew it, citizens and the court rejoiced in their newfound wealth and refined culture, while Embassy after Embassy of foreign visitors arrived and enlivened the lives of those close enough to be comforted. Cultural exchanges were renewed, and although these remained mostly limited to the realm of the elite families, new music, theatre and idea's were sparked among the various layers of citizenry overtime leading to changes in people and society as a whole. Although, as written, the city had become more international, this certainly does not mean just anyone could go and travel to the Capital to have a look around. On the contrary, living in a highly stratified society the likes of which seem almost unimaginable today, only those who were invited by higher powers were able to reach the Capital (often via the Grand Canal). This especially counted for Foreigners, who although generally welcomed by the visionaries at Court, were altogether shunned from the reviving Han Chinese Nation and not allowed to reside within its borders. 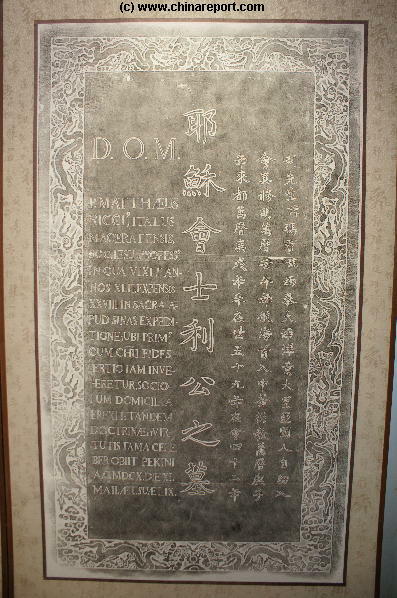 As later generations of arriving Foreigners, such as the Jesuits sent by the Pope in the 16th century would find out, citizens without the appropriate social standing and according "Guangxi" could only hope to make enough connections to eventually be invited, and so make such a journey to what amounted to the greatest but also most "Forbidden City" within the State. As various and books and histories recount, and as one may find described in more detail further on in our history of Beijing, travelers to the City had to carry permits from the Provincial Mandarin Governor(s) along their way and were obliged to move up along the Central Axis of the City for their arrival. Only those with special invitations were allowed within the confines of the Ming City Walls, which usually meant that they came for some sort of official business and were to be received by one of the many strata of the vast Government Bureaucracy housed in- and mostly around- and in front of the Imperial Palace of the Emperor. And that was all. Virtually no one below a top (international) level found themselves invited to the actual Palace, and yet fewer were to ever see the Emperor in person. In fact, such a high honor was very rarely granted. Those who did receive such an invitation would thus be highly exited, amazed but also trembling in respect and fear of not being up to the task and protocol ahead. View of Qianmen Dajie, after the year 2008 Olympics redesigned and turned into a rather high end but scenic and enjoyable shopping street anyone tourist must have visited. Follow the old Imperial Road of to the Front Gate of the walled city of the Ming Dynasty, today the represented mostly by the Qianmen but at the time a double lock gate which also included the Shenyangmen (Arrow Tower) which stands behind it. the most shocking and most impressive moments they ever lived through. Receiving such an auspicious start of its new Era, after briefly losing out to Nanjing as the Capital, throughout the ages of the Ming Rule it was a busy coming and going of Peoples at the Gates of Beijing. Merchants, trading caravans, emissaries and diplomatic missions, evangelists and missionaries, all passed back and forth to visit the most important City in the Nation. Thus, having essentially been refounded by the Yongle Emperor (Reign: 1401 AD - 1425 AD) upon his earlier fiefdom and with the official opening of his Forbidden City Palace in the year 1421 AD as the culmination, around a 100 years later during the far less visionary and tragically unambitious rule of the Jiajing Emperor of the Ming Dynasty (Shizong Reign Period: 1521 AD - 1567 AD) various interesting changes were made to the Imperial City as well as the larger Capital of Beijing. by a protective wall but a wide moat as well. 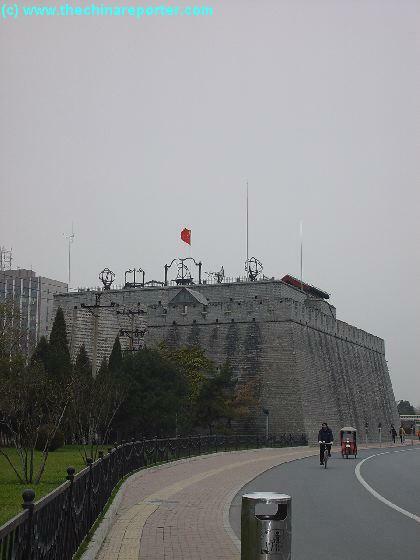 At the time of the Ming Dynasty, today's southern districts were not yet surrounded and protected by such a wall. The Capital resembled a giant bee-hive, the many expendable workers on the outside, the soldiers and scholars within, and in the very Center - The Inner Court (Nei Ting) of the so called "Forbidden City" lived the Imperial Family and The Emperor. The so called round or circular city with to the right a view of the white Dagoba on Jade island. 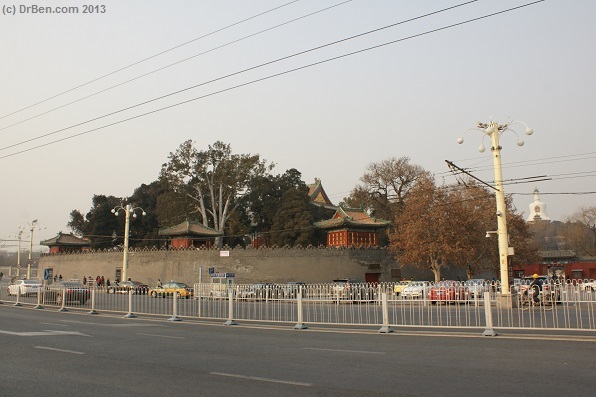 The south gate of Beihai Park can also be seen. Both the circular city and the Jade Island atop which the White Dagona sits are held to be remains of the original Palace of the Khan-Emperors of the Yuan Dynasty while they ruled Beijing between 1272 AD and 1368 AD. (Photo: December 2013). situated adjacent the south Gate of Beihai Park, the central line of the Yuan Capital lay slightly to the west of the current day one as established during the construction of the city in the Yongle Era. In a final step of geomantic disempowerment of the Old Capital, the Central Qi Life Line of the Yuan Capital was erased and an entirely fresh one was created a bit to the East. As one may still tell today, the new Palace of the Ming Dynasty Emperors arose a bit to the East of the Mongol Palace establishing a new central line for a new city. In addition, in order to outrank (or outclass) any remaining magical energies that might yet remain in this line and the location of the previous throne afterward regardless, the new Palace for the Ming was also built in a location slightly to the south of its predecessor. Since, according to Feng Shui, geomantic energies and auspicious spirits derive from the south (which also represents earth) the Ming Powers would thus precede any lingering Yuan energies in any communications with the Heavens. As if all of this was not enough, in line with the rules of Geomancy (Feng Shui) materials gained from the raising of the Old Yuan Palace were reused in order to erect the giant Jingshan or Coal Hill which today still sits to the north and behind the new Ming Royal Palace protecting this Palace from "Evil Spirits" or "Forces" thought to always descend from the North (thus countering "Qi"). Thus, following a meticulously worked out plan based on ancient Chinese magical beliefs during the Yongle Era Beijing arose as an organized City with a Central Axis, or Qi Energy Life Line, running from YongdingMen in the South through QianMen Gate Tower and the Imperial Palace City to pass through Jingshan Hill and end at the Ancient Beijing Bell Tower (Zhong Lou). It was great if not just grandiose Capital indeed. Having founded and laid-out his Capital, subsequently the Yongle Emperor ordered the construction of city walls for the protection of all within. The construction of the walls began only after the completion of the basic grid of the city. The moat surrounding the Ming Royal Palace better known as the Forbidden City. In the center of the photo one can see the stone bridge which represents the central line of the city northward from its northern Gate Shenwumen. The Jingshan (Coal Hill), the top pavilion of which is clearly visible, stands on the same central line serving to block any negative geomantic energies emaniting from the north. (Photo: December 2013). 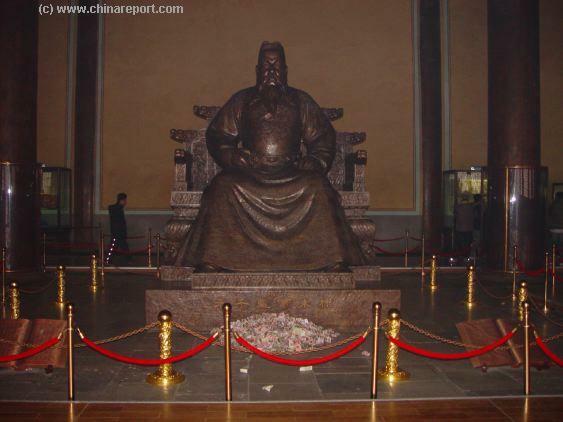 A Massive statue of Zhu Di, seated as the Yongle Emperor upon his Dragon Throne, an artist rendetion of the powerfull military man, strategist, thinker and dreamer found at the Hall of Eminent Favor a part of his Mausoleum Complex. Being in many respects a modernist who's visionary thoughts did not allow for blind conservatism, the Emperor found himself greatly resented by his traditionalist Confucian Courtiers. As one result, the Yongle Emperor chose to reintroduce the use of eunuchs at Court laying the foundations for more political woes after his death. In order for the succesful completion of this geomantic process of what amounted to large scale wizzardry, various essential steps steps had to be taken or otherwise the Capital would be more or less cursed or better devout of sufficient life energies from its very start. Such a thing could only spell eventual doom. Perhaps, as an expression of heavenly discontent with the usurpation of the Dragon Throne by the Yongle Emperor, the holocaust might arrive at the gates of the city in the shape of a Mongolian Army returnin the fallen Yuan to the overlordship of China. In a somewhat guilty feeling new Central Government which still found much resentment and opposition within regarding the illegal and violent change of the throne, the latter certainly was a risk no one was willing to take. A first essential step of course, would have to be the erasure of any memory of the Mandate of Heaven and the according Dragon Throne held by the Mongolian Emperors. Although, the last Yuan Emperor had fallen, according to various traditional Chinese beliefs, the spirits of the dead might yet wander. In addition, all the possessions of the former Emperors, the Palace and certain buildings might have been thought of- or found to be still embued with lasting magical energies. Hence, (virtually) the entire Imperial Palace of the previous Yuan Dynasty - a legendary Palace described by rare foreign visitors as an amazing wonder - was torn down in a first step of further dethroning and debasing the fallen Dynasty. Afterwards, in an important second step of magical humiliation its debris was to be used in various ways to found the new City. Sometimes in quite a literal sense. In addition to the Mongol Palace itself, the great walls protecting the Mongol Capital of Dadu and the sanctity of its Dragon Throne were also raised. Again, in order to raise the Feng Shui or geomantic energies of the Ming Capital parts of the Yuan Era Walls were to be reused to found the new City Walls of the much larger Capital in the planning for the Ming Dynasty and the Yongle Emperor. Although one could not tell today, as since the Ming Era Walls have also largely been torn down, parts of the western city walls stood on top of the the raised Dadu City Wall. Thus, having essentially annihilated essential elements upholding the Qi Energies of the old powerseat of the Mongolian Dynasty a fresh Palace, Qi Lifeline, Dragon Seat and Imperial Altars of Heaven could arise to Empower the new Dynasty and Nation. Only one more criterium had to be met. Significantly, as one may find upon closer studies of Chinese histories and the various tales attached to many top historic sites in Beijing, as traditional Chinese beliefs would have it; in order for the building of the new Ming Capital to have any chance of success or better "auspiciousness", the Geomantic energies of the Old Capital had to be disempowered before a new auspicious geomantic lay-out could be created and properly imbued with geomantic energies which after all, would have to fuel the Qi (Life) energy of a new Capital and a New Dynasty situated in almost the same location. Although Marco Polo had reached Beijing during the years of the preceeding Yuan Dynasty (1271 A.D. - 1368 A.D.), thereafter it was only as late as during the Ming Dynasty Era that the First Westerners again reached China, and eventually managed to visit Beijing, although that would certainly prove not to be an easy feat to accomplish. The first Foreign contacts of the Ming Empire with any European nation had been established by the Portugese in the 16Th Century, and they had been locked into a walled city on the island of Macau, which was not even part of the mainland. The Portugese jealously guarded their trading rights and although Canton (Today: Guangzhou) was added as a trading point, no one actually had access to the giant Ming Empire beyond. This situation was maintained throughout the 16th and 17Th century and in this period therefor any European to travel to the Chinese Middle Kingdom usually entered through the Portugese settlement at Macau. In the face of still very limited contact and knowledge of Cathay (China) on the side of the Europeans, first pioneering work was entirely done by but a limited number of Jesuit Missionaries who ventured to convert the vast and untouched "hedon" masses of the Chinese Empire, and if possible the Emperor and therefor the Empire. In the process of their venture they layed the foundations of would grow into a lasting contact between the east and west lasting to this very day.